While construction was paused during the European Games, the building spree that has transformed the city is expected to resume as soon as the competition is over. Authorities in Azerbaijan assert that playing host to the European Games marks the emergence of a self-assured nation capable of staging a major international sporting event. But some residents of the host city, the Azerbaijani capital Baku, are reserving judgment. To them, the accuracy of such statements will be determined by developments after the closing ceremonies on June 28. The activist, like most other individuals who discussed their views with EurasiaNet.org, spoke on condition of anonymity, citing fear of possible retaliation by their respective employers or government officials. What is certain at this stage is that the Games physically transformed Baku. The city is quieter and less crowded than usual. Construction projects were halted, and a ban imposed on public funerals, weddings and even hanging laundry outside. In addition, older vehicles and those registered outside the city were banned from entering Baku. London-style taxis circle the uncharacteristically traffic-free streets, and new metro trains are air-conditioned and new buses use dedicated lanes down the middle of major roadways. Several stadiums, a few swimming pools, and an Olympic village for 6,000 athletes were built to accommodate the athletes and complement Baku’s glitzy architectural style. “Horizons of pleasure, of excitement, of possibility are all wrapped up” in such projects, said Bruce Grant, a New York University anthropologist who has researched Baku’s ongoing building boom. “It buys the government an extraordinary amount of time” among locals for its policies. The condemnation has only made the government “feel even more isolated and paranoid,” a civil society activist claimed. 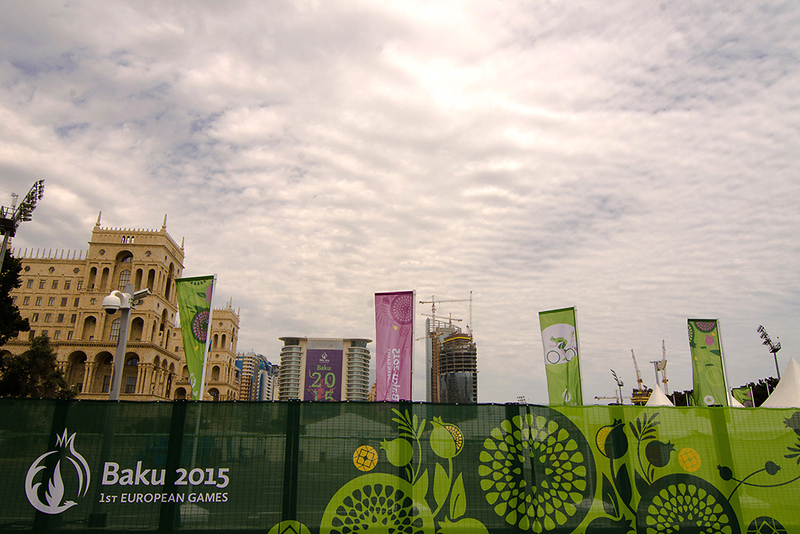 When the Games opened on June 12, there was a palpable sense of pride in the air among Baku residents. The opening ceremony culminated with the Caspian Sea coastline being lit up by fireworks. “It was really beautiful; maybe it will be worth it after all?” exclaimed one English-language teacher. Over time, concerns about the Games’ costs have gained prominence. Many wonder whether the government’s expenditure of nearly a billion dollars on the event was money well spent? Some complain that they are being asked to bear an unfair financial burden: for example, one vendor at a stall near Baku’s downtown Fountain Square said his usual 600-manat ($571.59) monthly rent grew by 200 manats ($190.53) as a special “tax” for the games. One man, whose family was fighting eviction from the Sovietskaya neighborhood, compared Azerbaijan to a mediocre artist who buys a gallery to show his work. “Of course, people may look, but they will laugh behind his back,” he said. While authorities may have gone to great lengths to sanitize the scene, Baku residents seem keenly aware of the government’s flawed democratization record. A private security guard, who complained bitterly about alleged corruption and crackdowns, urged a visiting foreigner to “write only good things” about the Games.